Martyn Sibley recently sold a business to AirBnB. He has many other business successes under his belt and is a regular presenter on TV and radio. He travels the world hosting inclusion events and likes to take part in high adrenaline adventures. His favourites are skiing down the Catalan mountains, hot air ballooning above Barcelona, scuba diving in Tenerife, and Husky dog sledging in – 32° in Helsinki. Martyn’s longest adventure was the 1000 mile trip from John O’Groats in Scotland to Land’s End in Cornwall, England. In his wheelchair. 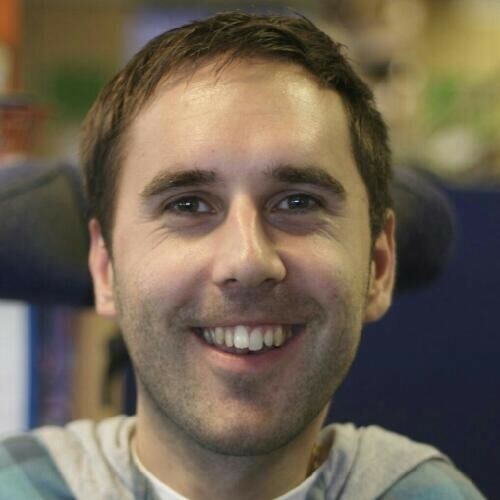 Martyn was recently voted the third most influential disabled person in the Power 100 list. In this talk Martyn, with his customary humour and insights, explains how he manages to do all the things he does from his wheelchair, how he learned to use social media to build his influence and start and run successful businesses. With a Masters in marketing and a few years working for the disability charity, Scope, Martyn took a risk and started his own business. He knew that through the relatively new medium of blogging and social media (circa 2008), he could make a positive change for disabled people. It started slowly but over time he found his voice. Martyn learned what disabled people and their families needed. He networked on and offline. He worked for free. He had patience and resilience in equal measures. Eventually, he was asked on to BBC breakfast and Radio 2, to write for the Guardian, to speak at big inclusion events, and to present accessible tourism videos. 8 years of hard work had paid off! So recently Martyn has found himself with a lot of ‘influence’ and power in his field.